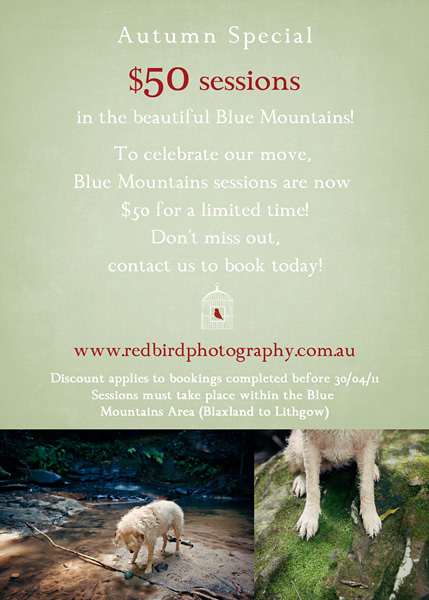 For all Katoomba and Leura dog lovers, we’re celebrating our move to the Blue Mountains with a $50 session special. Previously based in Sydney, we’re proud to finally call the mountains home and so we’d like you to help us celebrate! If you have a pampered pooch or cat that you regard as a special member of your family, give us a call today. All creatures great and small are welcome! We are also available for [human] family sessions, contact us to see a sample session. Be quick, book early to avoid disappointment! This entry was posted on Tuesday, March 8th, 2011 at 2:39 pm	and is filed under Classifieds, Events, Mountains Life, News, Uncategorized. You can follow any responses to this entry through the RSS 2.0 feed. You can skip to the end and leave a response. Pinging is currently not allowed.